I had been looking forward to this wedding all year. A beautiful and loving couple who are detail oriented, have great taste and were getting married at one of the coolest locations ever, who could ask for more? And then it happened. Every photographer's worst nightmare: A rainy forecast. This past season, every time it called for rain it held off. The forecast had been seeming to work in my favor all year and I thought for sure that it would be no different this past weekend. Even the morning of the wedding, while cold, it was only misting, and I did a little happy dance, (while no one was watching of course) for my luck with the weather. And then it happened. As if on cue, just as I was finishing my dance, the clouds opened up and rain came pouring forth. And I don't mean just any sort of rain. I mean deluge of the Noah variety. My hopes of shooting this wonderful couple with the 270 degree view of the valley covered in beautiful Vermont foliage were shot down right there. The forecast was definitely NOT going to work in my favor this time around. But no matter what happened, Ben and Kristen kept smiling. A genuine, loving smile that said, "I am so happy." And yet, despite their amazing attitude, I was depressed. Here I was in this beautiful location, with this beautiful couple and all I got to photograph with was this tiny little overhang in a smelly barn. But then Ben said something to me as I was quickly posing that made me stop and readjust my attitude: "Deb, we made peace with the weather days ago and we're just going to enjoy every minute of our day no matter what." Leave it to my clients to place everything in perspective. No matter what the day threw at them, Ben and Kristen were determined. Determined to enjoy every minute of their wedding day. Because in the end, it doesn't matter if it rains or not on your wedding day. In the end, as important as a wedding day is, it's just one day. One day of the rest of your lives together. One day that marks the beginning of a life spent loving one another. They wanted to remember that day with a smile. Bam. I needed to change my attitude. If my clients were happy, then I needed to be happy. I needed to stop and enjoy the day with them. In the end, the rain didn't ruin anything. 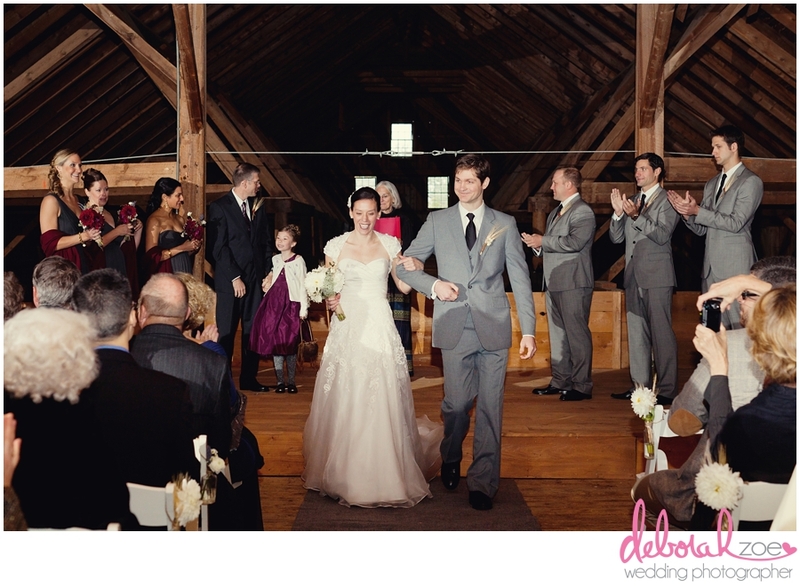 In fact this this one of my favorite weddings from this season. Not for some "perfect" location or some "perfect" detail, but because of my clients. Clients who love each other and who remind me, that at the end of the day you can either complain about what life throws at you or you can embrace it with a genuine smile that says, "I am happy."